Our favorite royal baby name of all time is Charlotte (not to worry, George, we love you too!). And if like Meghan Markle, you’re also looking for baby name inspiration, you’ll never go wrong with royal baby name for your son or daughter. Invariably, the ruling class picks timeless names that are steeped in history. 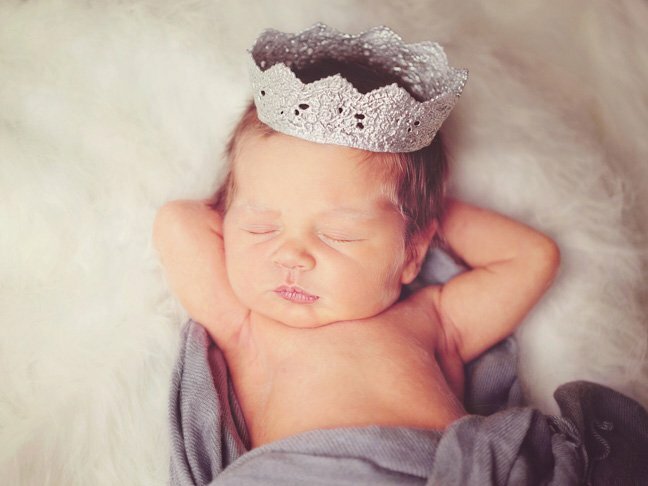 Consider these classic royal baby names for your little prince or princess. Our favorite royal baby name is Grace. Actress Grace Kelly— you’ve seen her in Hitchcock’s classic, Rear Window—went on to become Princess Grace of Monaco. It’s a simple virtue name, but one that suited this princess perfectly. A royal name associated with the “Great” ancient emperor, plus a few Russian emperors and several Popes. It’s also one of the middle names of little Prince George of England. Anastasia was most famously one of the princesses in the final days of the Russian Empire. Anastasia means “resurrection,” and is currently in the top 200 baby names in the U.S.
King Arthur and his legendary Knights of the Round Table lend this name some extra panache. Arthur means “bear,” and it’s currently on an upswing in popularity in the U.S. The first Roman emperor sported this name, which means “magnificent.” It’s currently regained attention, thanks to its use for Augustus “Gus” Waters, the romantic lead in the popular YA novel The Fault in Our Stars. Most associated with Russia’s Catherine the Great, it’s also the moniker for the current Duchess of Cambridge, several British queens, and Catherine de Medici, who ruled in France. The royal name means “pure,” and comes with a number of different spellings with varying levels of popularity—Kathryn, Katherine, and Katharine, to name a few. It’s no wonder that this name reigns as one of the red-hot royal baby names right now—Charlotte, the feminization of Charles, was picked for the adorable young daughter of William and Kate. More than a dozen royals in history have sported the name, including queens of France, England, and Denmark and an Empress of Mexico. Charlotte is currently on the top 10 list in baby name popularity. One of the most popular British royals was Diana, the Princess of Wales, who sported a name that means “divine.” This royal baby name is currently in the top 300 baby names in the U.S.
Two Scottish kings bore this name, which means “dark-haired.” King Duncan was a character in Shakespeare’s legendary play Macbeth. More than a dozen medieval-era royals made this among the most popular queen names of all time. One of the most powerful queens in Europe was Eleanor of Aquitaine, who wed both Louis VII of France and Henry II of England. Eleanor has been on a sharp rise in popularity since the 1980s, and is currently in the top 50 baby names in the U.S. There can be little argument that this name rules among the queen names. Elizabeth was the pick for two of England’s most storied monarchs—Elizabeth I, the “Virgin Queen,” who ushered in a golden age of British culture, and the current ruler, Elizabeth II, who has presided over the country for the past 65 years, as the longest reigning royal in British history. Elizabeth is consistently popular here in the U.S. as well, where it’s currently a top 20 favorite. There have been six King Georges in England (with the potential seventh, little Prince George, already in line), two in Greece, and 12 in Georgia. George means “farmer,” and is currently a top 150 pick in the U.S.
Henry has been one of the most-used royal baby names in Europe. There have been eight Henrys in England, seven in the Holy Roman Empire, five in France, and 17 dukes of Bavaria. It’s a top 25 classic that actually means “ruler,” so it’s truth in advertising. This Norse name means “beautiful,” and has been well used within the royal families of Scandinavia. Actress Ingrid Bergman, however, may be the most well-known wearer of the name. A bold name that means “great,” Magnus has been one of the more popular royal names for men in Scandinavia, including seven Norse kings and four Swedish kings. A relatively overlooked Scottish moniker, Malcolm was used for four popular Scottish kings. In the U.S., it’s also well known for its association with civil rights leader Malcolm X. It’s currently in the top 500 in popularity. Perhaps the most enduring royal baby name for boys is Nicholas, currently in the top 75 baby names in the U.S. The name means “victory,” and it’s been used by Russian emperors, several popes, and the king of Montenegro. This grand dame of queen names was used for one of the longest-ruling monarchs in England, and means (unsurprisingly) “victory.” It’s one of the more popular royal names—used for queens of Spain and Sweden, and several European princesses. It currently sits in the top 25 names in the U.S.